When promoting your Vacation Rental to markets outside your local region, be aware that the same keywords that return a set of results to you on google, might return totally different results from another location. 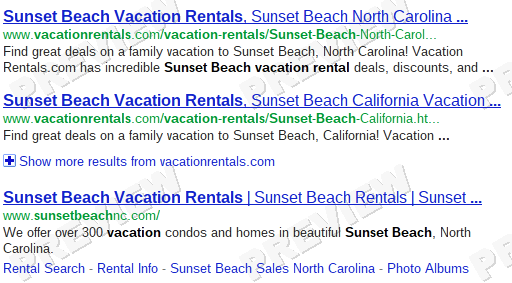 For example, someone searching for "sunset beach vacation rental" on google.com from North Carolina will see very different results from someone doing the same search on google.ca from Ontario, Canada. 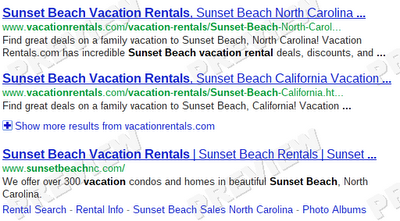 Specifically, vacationrentals.com ranks #1 on google.ca for that search phrase when conducted from Ontario. 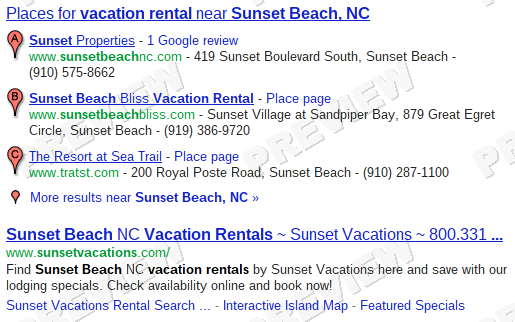 vacationrentals.com doesn't even rank in the top 3 when searching on google.com from North Carolina. 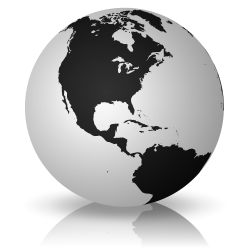 So the lesson is to be aware that your SEO needs to be regionally aware. If you choose to advertise on listing sites that rank well on google when you search relevant keywords, you might be missing out on sites that rank better from other locations. But how are you supposed to know how well websites rank from other locations? Google AdWords Ad Preview and Diagnosis is a free tool that will show you exactly this. You enter a keyword or phrase, and pick a country, state/province and for some places even down to a city. You also pick the google search domain (e.g. google.com or google.ca). It will then show you exactly what a user conducting that search will see. And here's the top 3 results (after the advertisements) that this search returns (which I can verify personally since I happen to be in Mississauga Ontario currently). There can be other factors affecting the specific search results for an individual. For example, Google will show results matching sites shared by someone in your google+ circles. But in general this tool will provide you a much more accurate picture of what a user in that location will see than you can get just from conducting the search yourself.